I've been making a lot of progress with my hexie flower quilt. 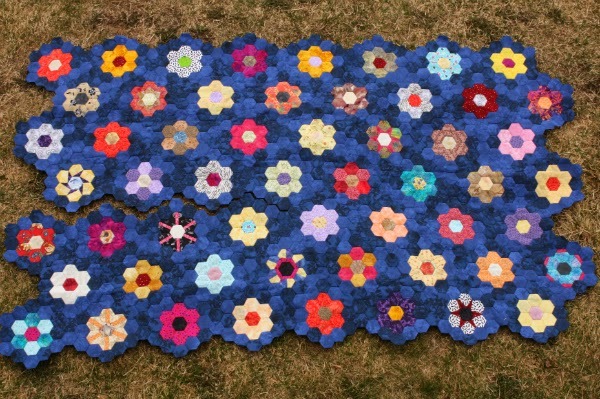 Only half of a long seam left to go and then all 56 flowers will be joined into one unit! It actually feels like a quilt now as it's draped over me while I'm sewing. Well, except for the paper stuck in it, that is! Ignore the dead brown grass. Spring still hasn't quite arrived here, though I did see my first crocuses this morning. I've been making this quilt up as I go along, so I never really considered the irregular edges until recently. So now I am basting more hexies to fill in those gaps and make a properly rectangular quilt. After all, what's another 193 to baste, sew into the necessary units and then attach to the quilt top? Good thing I really enjoy the whole epp process! Plus, the whole top has now become too big for me to work on while we're driving out of town, so tomorrow I can take my basting kit and I'll still be able to spend a couple of hours stitching. Since I was starting all over again with the basting, I took the time to write my first tutorial this week. 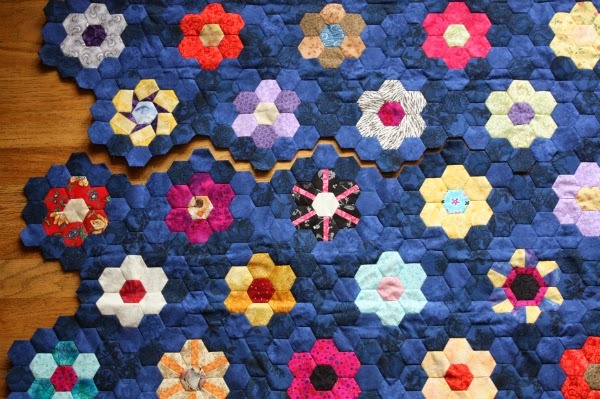 If you missed it, you can check out how I prepare hexagons for english paper piecing. Do you like the new look on my blog? I've been following along with Erin at Sew at Home Mummy and her Beautify Your Blog series. It has been packed full of helpful information so far and I'm looking forward to the rest of the series. I hope you're having a great weekend. Have a Happy Mother's Day tomorrow! Leeanne, this is such a delightful piece. Love that you used those various blues - really impacts it nicely. Hope to be able to hexie this week. Incredible! You are a devoted quilter. In more ways than one! This piece is looking amazing. I am so glad you have stuck with it. Looking good!!! Wow! Looking great! This will be an awesome finish for sure. Wow! I am also doing an EPP and this is just impressive. So much (wonderful) work! This is so lovely, can't wait to see the finished result. Oh it looks great! Good luck with the next 193 pieces!! Wow! This is stunning. I can't even imagine how long this took. Evening up the edges is a great idea.